I mentioned in my Simple Brownies post that I was more of a blondie man than a brownie man. Thus, a blondie recipe. This blondie recipe is simple and pretty much impossible to screw up. I don’t really try other blondie recipes (much), because this is all you need. 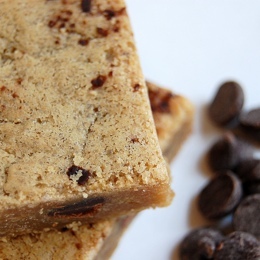 It’s from Smitten Kitchen‘s blondies. If you check out the URL there, you can see “blondies-for-a-blondie,” which is what I used to type into Google whenever I wanted the recipe. 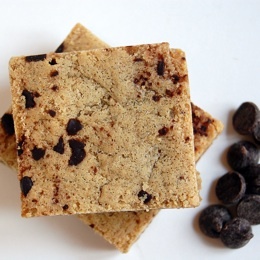 I’ve tried many things, but my standby with this recipe is to just throw in a bunch of chocolate chips or chopped up semi-sweet milk chocolate. In the pictures for this post, you can see I used chopped up chocolate – those smaller specks are the tinier bits I didn’t bother to throw out. The blondie recipe is very fast and very easy. 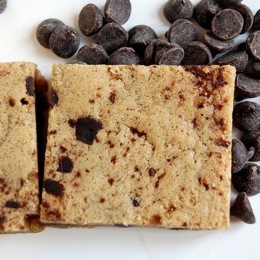 It tastes like a chocolate chip cookie and a brownie in one. You can also use these blondies, with some ice cream, whipped cream, and chocolate sauce to imitate Moxie’s White Chocolate Brownie dessert. I usually just dip my blondies in milk, like a chocolate chip cookie, because that’s how dreams are made. They’re basically gooier chocolate chip cookies. Mix melted butter and brown sugar. You don’t need an electronic mixer; use a fork and stir until smooth. Sift salt and flour together, then add this to the wet mixture. Throw in the chocolate chips or whatever ingredient you’d like. Add 1/2 cup of walnuts, pecans, white chocolate chips, or anything, really, either in addition to or in place of the chocolate chips. Add in a mashed banana (and some walnuts). Add in a few tablespoons of peanut butter and some peanuts. Throw on some mini chocolate chips and demerara sugar on top. 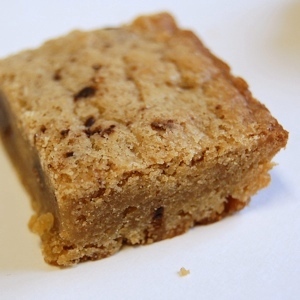 These blondies are pretty much a blank slate for anything you want to try. But I like ’em simple.